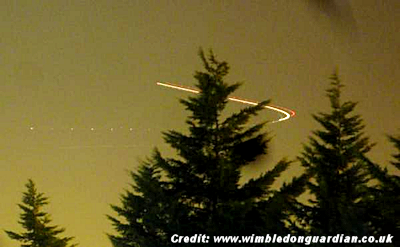 A series of extraordinary videos and photographs of UFOs have been shot in the skies over Wimbledon in recent weeks. Camilla Noble, 33, of Caroline Road, has been filming and photographing what she believes to be flashing spaceships from her bedroom window for the past month. She contacted the Wimbledon Guardian this morning about the sightings, and her mother has since confirmed that she witnessed one of the strange occurrences.